NOW BOOKING FOR 2020 -FULLY BOOKED FOR 2019 SEASON, thanks to all our returning guests. A luxury 3 bedroom single storey villa with private 10m pool, patio area and extensive gardens densely planted with flowering plants and shrubs. High quality sun beds and patio furniture, and a gas BBQ all provided. Spacious and modern this villa offers something different. Fully equipped and everything provided, even Internet Wi-Fi, golf clubs.46 inch lcd TV Located in Peyia, nr. Coral Bay Cyprus. Magnificent unobstructed views of the coastline. Some 350m above sea level. The most stunning feature of this villa is its views of the entire coastline. Every room, including all bedrooms have spectacular views and patio doors opening out onto the pool area. All 3 bedrooms have en-suites. The villa is accessed up a winding tarmac road, making a car essential. The village of Peyia offers supermarkets, tavernas, bakery, chemist and bars. Some 5 min drive away is Coral Bay with it's beaches, bars, restaurants. Children under 10 years of age not accepted unless by prior arrangement with owners. Hello, we are Ian and Linda, hence the name Villa Linian. We had the property constructed to our own specification in 2002, to be used as our holiday home and our permanent home on retirement. We have been married for some 40 years. Love travelling, especially islands and beaches. We still have our home in the UK which is also by the beach at Southend on Sea, Essex. We chose to be in the hills above the village of Pegeia as we wanted uninterrupted views and a quiet location, not on a holiday complex. We were very lucky to find this site with just 11 villas privately owned by English expats. The villa offers some of the best views in the area, every room has uninterrupted views of the coastline. As we are on a no-through road there is very little traffic. We love our garden which is well stocked with flowering shrubs. En-suites with shower /wc to bedrooms 2 and 3. En-suite with bath/shower/wc to Bedroom 1. Massive living area with 46 ins TV receiving the UK channels, HiFi, Wi-Fi, air-conditioning. 3 x large 3 seater leather sofas, dining for 6 people and breakfast bar. Large patio doors onto the pool with 180 degree coastal views. Fully equipped with granite worktops, full cooker with oven and grill, washing and dishwashing machines, microwave and fully equipped in every way. Hi- tech drinking water system, better than bottled water. Also has sea view. Several golf courses, the nearest being about a 40 min drive. Notes on accommodation: All rooms are air-conditioned (no charge is made for this). Free wi-fi in villa No children under 10 years without prior agreement with owners. Outside: Private 10m long pool, 6 sunbeds, outside dining for 6 people, gas BBQ. The property is set in 800 sq.m. of gardens filled with flowering shrubs and plants. Only 1 of 11 villas set on a private road with no through traffic - ours is the only one used as holiday rental (the others being privately owned and lived in as their main residence - as a result it's very quiet and we expect our guests to respect the tranquillity). The open plan design of the interior and outside areas makes it unsuitable for young children as the pool is accessible from all areas, please email us to discuss this. Cleaning / Towels / Linen / Maid service: Cleaning and linen changed weekly or more frequently if requested. VIlla Linian is a lovely one storey villa set in the higher areas of Pegia so a hire car is essential. The setting gives you amazing views daytime and evening when all the lights are twinkling in the distance, you can see right to PAphos. The villa and pool are kept really clean by the excellent service from the maintenance man John who is an asset, we love to have a chat to him when he calls and hear about all the local places of interest and what's been happening in the area since our last visits. Any issues he is on hand if needed and happy to help. The villa is large three beds large lounge and kitchen with everything you need for your stay. Real home from home and not at all like a holiday property. Large clean pool and outside furniture for alfresco dining and sun bathing. Sitting in a morning drinking tea and eating breakfast looking across at the view is so relaxing to start the day. There are all the local facilities in the village itself and with two larger supermarkets nearby and plenty of smaller ones you are not stuck for choice. We hire a car through Zest and pick up at the airport each time we visit saving the taxi fares to and from the airport. We always have to visit the island cove mini golf which has a great course. The whole holiday Booking and any correspondence with Ian the owner makes for easy experience as he provides any information you may need and if late checkout required and able to be facilitated it makes for a great end to your stay. The only pity is the villa has become so popular we are only managing one visit next year. Thoroughly recommend the villa and the area it is situated in but remember the car is a requirement. So many places to see and visit around the island that the car gives you the freedom to see everything possible. The roads are mostly good but be careful as some of the drivers leave a little to be desired and think they are the only person on the roads! Take out a yearly hire car policy at home it's cheaper than paying per visit with the hire car company who only provide basic cover. Most of all you will enjoy your holiday and won't want to leave. Thanks for the lovely review, so glad you enjoyed your holiday at Villa Linian and exploring the surrounding areas. We look forward to welcoming you both again in 2019. Wonderful Villa with stunning views! We have just returned from another visit to Villa Linian (we have been quite a few times now! ), and as usual we were not disappointed. The location is just perfect for a quiet relaxing holiday, and we never tire of looking at the fabulous views. The villa itself is very spacious, well maintained and clean, and John is always on hand if there are any issues or questions. The local Phillipos supermarket is great for stocking up on all the essentials, and there are plenty of tavernas to choose from - if you can tear yourself away from the villa! Thanks for the lovely review, it's always nice to hear that our guests enjoyed their stay at Villa Linian. We look forward to welcoming you and your family again next July. Superb villa, in a wonderful setting. heaven on earth! Our third year of coming back and we will be back again next year. Superb villa with a lovely pool and the view is second to none. Local amenities in the village are good, especially the bakers and the little gem of a supermarket. Only a short drive away from Coral Bay restaurants and the sea. Thanks for the great review. it's always nice when people come back. So glad you all enjoyed Villa Linian and your holiday in Pegeia once again. First visit but like previous guests we are converted by this lovely villa which is very popular. Everything is as described on the website, the setting is superb and the facilities and equipment excellent. The main supermarket at the Coral Bay cross roads stocked everything required with full butchery department; fresh bakery, frozen provisions etc. so we made use of the Gas BBQ on a couple of evenings watching the sunset. The villa is located in a village up the mountain from Coral Bay and supplies are also available from the shops in the village. It was very quiet and relaxing in the villa, but for those that want more life this could be found in Coral Bay or Paphos both easily accessible. Can recommend Oniro by the Sea and the Sea you Bar for sunset drinks and cocktails. This was the best villa I have stayed in whilst on holiday in Cyprus. Ian was great to deal with and everything was so easy. 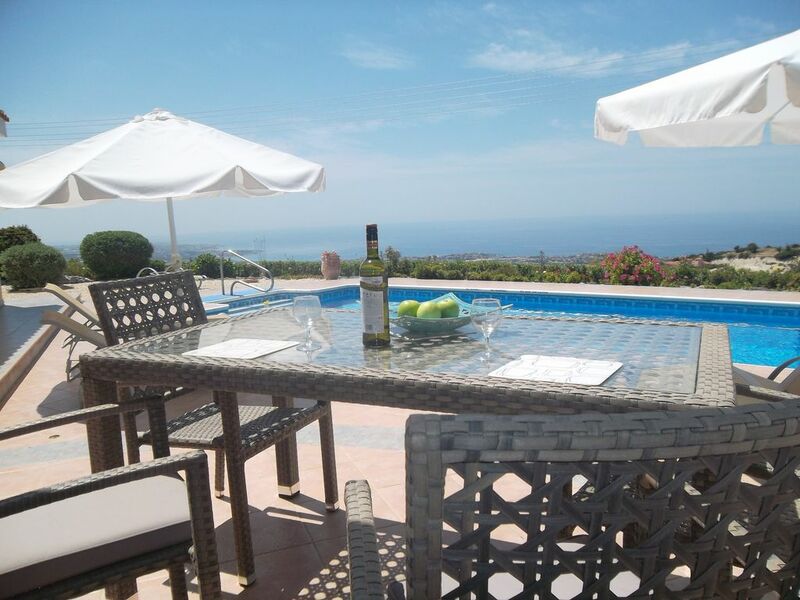 The villa is located in a lovely area with stunning views. Loads of local taverna to choose from. I really liked the information pack in the villa. Once again it's the best I've stayed in on holiday in cyprus. Thank you for the lovely review. So glad that you and family had a great stay at Villa Linian and enjoyed the village of Pegeia. Hope we'll have the opportunity of welcoming you again. If you do decide to come at any time please email us as early as possible as we're nearly fully booked for next year already with returning guests. Coral Bay with the best beach in the area is only 5 min drive. Paphos about 20 min drive. Paphos airport is about 45 mins drive and Larnaca airport is about 1 hr 45 mins on the superb motorway. The village of Peyia is a 2 min drive or a 15 min walk down but it's a steep hill all the way back. The village of Peyia offers supermarkets, tavernas, bakery, chemist and bars. Some 5 min drive away is Coral Bay with its beaches, bars, restaurants and night life, all forms of water sports including diving, parasailing, etc. The large tourist town of Paphos, some 20 min drive, offers all the facilities of a large holiday destination.